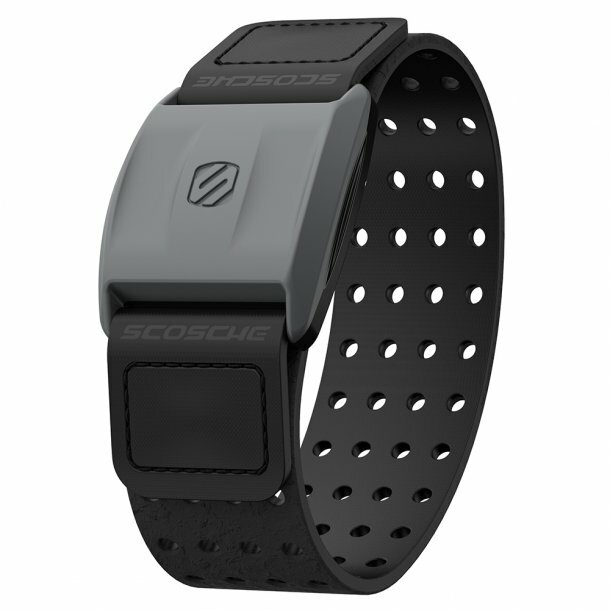 The Scosche RHYTHM+™ is the best heart rate monitor. It is an all new workout tool for managing heart rate, calories burned, distance, pace and more. Accurately monitor your intensity level. This heart rate monitor armband has been hailed as the best heart rate monitor available today. This revolutionary exercise and fitness tool accurately monitors heart rate allowing you to maximize your workouts. This heart monitor employs patented optical sensor technology for highly accurate monitoring and measurement. Many other heart rate monitors fall short in this area, but the high-quality Rhythm+ excels in providing remarkably accurate measurement of exercise intensity. "Breathable" neoprene armband design means greater comfort and ease of use. Comes with both a large and small armband. Additional armband colors available for purchase. This array provides superior measurement across all skin tones, making the Rhythm+ superior to monitors and watches that employ only green sensors. With the built-in Bluetooth SMART and ANT+ you can stream your fitness-data in real time to any one of the hundreds of compatible iPhone and Android apps, fitness watches, bike computers and fitness equipment. Bluetooth SMART gives you the freedom to work out up to 100ft away from your Smartphone.